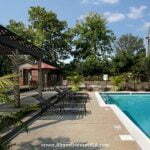 Set aside from the fast paced action of Lexington, these Lexington furnished apartments are on manicured grounds with award-winning landscaping. You can relax at the . . . 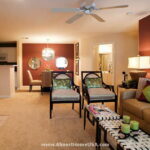 This beautiful Lexington corporate housing community is designed to make coming home a tranquil, pleasurable experience. One, two and three bedroom apartments may include designer . . .
We serve the entire Lexington area including Newburg, Clarksville, Jeffersonville, New Albany, Jeffersontown. Almost Home welcomes you to enjoy corporate housing Lexington KY at its best. Our luxury furnished apartments throughout Lexington KY are outfitted to meet the unique needs and preferences of each of our clients. Contact us today to get a housing quote that will you’re your own desires perfectly. Almost Home offers the following Lexington information for the purpose of assisting any Lexington corporate housing clients in getting familiar with the area they have taken up short term housing residence. Lexington is home to one of the most robust economies in the United States. It is grounded in manufacturing, government related services, technology and startups. Numerous Fortune 500 companies call Lexington home, including Lockheed Martin, Xerox and Lexmark International. The city's largest employer, the University of Kentucky, provides Lexington with a stable economic platform that is recession-proof and keeps the city busy during the school year. The economic base also extends to the spin off companies resulting from the research that takes place on campus. Dressing appropriately when stepping out of your Lexington furnished apartment will be determined by the time of year you happen to be in town. Lexington is warm in the summer, reaching a high of 86°F in July. Summer temperatures vary between 70 and 85, then taper off to a cooler 55 to 70 degrees in the fall. Winter stretches over December to February with the highs barely in the 30s but the lows dipping to as low as 25°F in January. Lexington corporate apartment residents may find that a brief summary of Lexington’s history will add to the charm of their stay in town. The city of Lexington predates the state of Kentucky by 17 years. It was named by William McConnell in honor of the Battle of Lexington, Massachusetts, which was won by the colonists in the Spring of 1775. McConnell was the leader of a party of frontiersman, who were encamped at Elkhorn Creek, present day's Town Branch, when they got word of the victory and proceeded to name their campsite accordingly. By the early 19th century, Lexington had developed rapidly and was nicknamed the "Athens of the West" due to its cultured lifestyle and prominent citizens. Lexington was home to many of America's prominent names, including Mary Todd Lincoln and Confederate General John Hunt Morgan. The Chophouse on Richmond Road: Ribeyes, T-Bones, Filets and even Top Sirloins are just some of the cuts that are done to perfection here. The flavors are gregarious and bold. Try the Shrimp and Scallops or even the Lobster over the Steak. P.F Chang's on Nicholsville Rd. : There is great food to be had here and cocktails which are imaginative with flavors that are authentic..
Goodfellas Pizzeria on North Mill St: The pizzeria is crowded on the weekends and the energy is lively. The toppings are fresh and the sauce is authentic. Try the garlic bread and the pepperoni pizza. Taj Indian Restaurant on Patchen Dr: Try the Mulligatawny Soup if you like your soups zesty. The Indian breads are fluffy and aromatic, and should be a part of every meal you have here. This restaurant serves authentic Indian recipes which can be a little spicy. If it’s a little much for you, ask the wait staff to tame it down a little. Schlotzsky's 1814 on Nicholsville Rd: The nice place to grab a bold sandwich and be on your way. The service is built on providing patrons with fast but high quality food. The large J.J. Gargantuan sandwich is generous in size, taste and variety. It is a giant of a sub, packed with smoked meats and familiar cheeses. Got some down time and looking for a little action? Step out of your furnished apartment and enjoy some of the entertainment options that await you in Lexington. Museums: Whether you are an aviation enthusiast or otherwise, the Aviation Museum of Kentucky on Airport Rd. is a thrilling experience with exhibits of classic planes and warbirds. You will get to see some of the planes that were part of battle in the Pacific theater and over Europe. Performing Arts: The Lexington Opera House on W Short Ave. has a strong line up through the entire year. Various choral and musical troupes visit, showcasing their eclectic talent, while renowned symphonies take the stage with impressive movements. The operas that grace this venue are world class ranging from classical Don Giovanni to Snow White. Malls: The mall in this town, where you will find almost anything you need, is the Fayette Mall on Nicholsville Rd. Here you will find stores like Kirkland's, Lush and Christopher & Banks. You will also have the convenience of Dillard's, JCPenney, and Macy's here. There is a Cinemark 16 on the property as well as a good selection of food and beverage outlets. Golf: Within a few minutes drive of downtown Lexington you will find Tates Creek Golf Course on Gainesway Dr. The course is built on 125 acres of lush foliage and natural lakes. It presents players with tight sloping greens and water hazards on two of the holes. Parks and Recreation: The Kentucky Horse park on Iron Works Parkway is a well maintained facility. It is managed, among other parks and recreation centers, by the Lexington Department of Parks and Recreation.